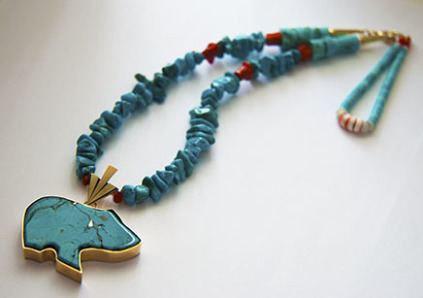 Materials: 18K yellow gold, turquoise stones, red coral, white shell. 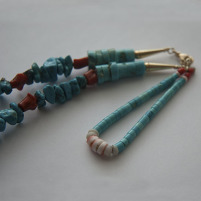 Turquoise and red coral nuggets; a natural hand-cut turquoise stone set in 18K gold and with a sterling silver back; a jacla of turquoise and red coral heishi and white shell disks. *Shipping costs included, US and Canadian tax rates excluded. **Shipping costs excluded, Dutch BTW included. 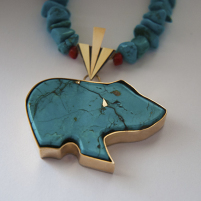 > Visit our Art Blog to read about the symbolic meaning of the necklace.